RGC 1st Annual Club Competition a Great Success! Congratulations to all the athletes who participated in the 1st Annual RGC Competition on Sunday May 11th 2014. You all did a fabulous job with your routines on the day and the coaches are VERY proud of each and every one of you! We had over 60 gymnasts compete the level 1A routines in the morning session. For all gymnasts involved this was their first competition experience. Although battling nervous energy each gymnast successfully competed floor routines with beauty and grace. Along with floor routines each had a vault to perform too! Gymnasts sprinted down the vault strip performing powerful vault after vault! Excellent work gymnasts! In the afternoon session we saw a mixture of some of our young level 1 club gymnasts and our older pre-teens compete the 1B and 1C routines. The gymnasts made it look easy! Performing on vault and floor with fantastic strength and agility. Excellent work overall by all the gymnasts involved! We can’t wait to start getting ready for next year! Good Luck getting ready for GYMFEST! Another round of applause for all the volunteers who made the day possible. Thank you for your support, time and dedication. Without you such an event would never have been possible. Anyone interested in getting involved with next years competition please let us know. In continuing to build the relationship between Renmore Gymnastics and Special Olympics Ireland, we will jointly be hosting a public meeting with a view to establishing a new club, Galway Special Olympics Gymnastics Club. The meeting will take place at 8pm, Monday Feb. 24th, at our training centre. Kitty Tierney of Special Olympics Ireland will be speaking at the meeting. 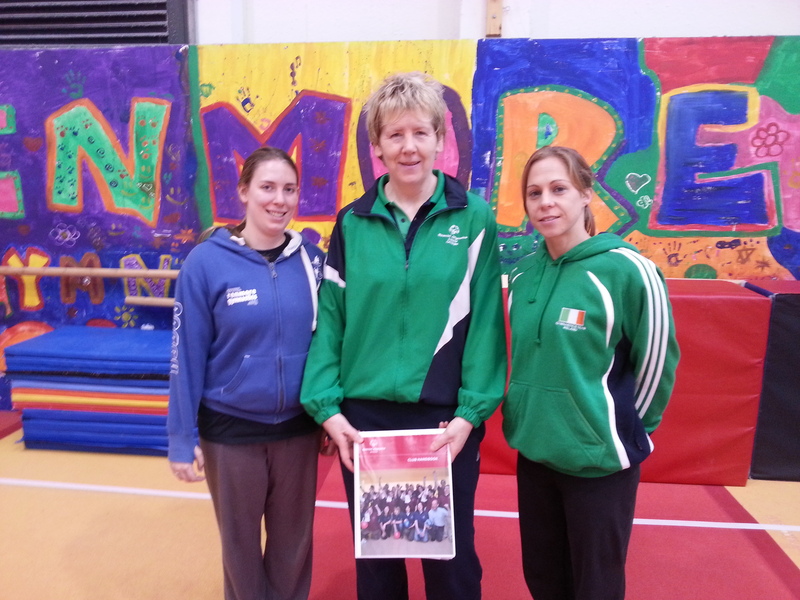 The new club extends the relationship already growing between Renmore Gymnastics and Special Olympics Ireland. Its that time of year again and we are asking all families to please try to sell at least on Raffle Card for our Annual Christmas Raffle. This is an extremely important source of income for the upkeep of current equipment and the addition of new items of equipment to ensure that we stay the best gym in the country. We are extremely grateful to our sponsors Corrib Oil who have kindly donated €500 worth of vouchers for fuel. They are great supporters of our wonderful club. All gymnasts will have received a Raffle Card by now and we hope they are busily trying to fill their cards. There are prizes also for the top 5 sellers. In the past those who have sold up to three or four cards have featured in this group…………………….Good Luck to All! RGC Family Fun Day – Great fun had by all! Family Fun Day This event took place on Sunday November 17th at 2pm until 6pm. This proved to be a very enjoyable day for all. The feedback we have received is that all attendees had a lot of fun. We would like to say a very sincere thanks to all who supported this fun event by purchasing tickets, attending the event and also donating and purchasing books at the Book Sale where we sold second hand books for all ages. There were some great bargains there! Our next fundraising effort will be our Annual Christmas Draw – cards will be distributed in the next two weeks. Tickets cost €2 each with 20 lines on each card. We plan to have a Christmas Coffee Morning on the day of the draw – Saturday 21st December – come along and enjoy a coffee and a treat. Please note that new ideas for fundraising are always welcome as are people willing to come on board and help out at any specific events. RGC will be running 2 OPEN GYM events before Christmas on November 17th and December 15th from 2pm – 4pm. Classes are 2 hours long and cost €5 per child. They are open to both members and non-members aged 5+. Each class will consists of a mixture of instructional time at the start and finish with an extra long session of free open play. A great opportunity to give gymnastics a try! Tickets can be purchased in advance at reception in the gym. This Mid-Term October 2014 Drop In classes will run on Tuesday and Thursday. There will be an Open Gym session running on Friday October 31st. Please see here for our drop in class details. New Recreational Drop-In Classes For 10+! New Recreational Drop-In classes are starting this summer for all of you that want that extra bit of training. The classes will run on Mondays and Wednesdays throughout the summer months. A BIG CONGRATULATIONS TO THE RENMORE RECREATIONAL GYMNASTS!!! For the first time ever our recreational gymnasts participated in a year long multi-discipline program. The new program covered basic gymnastics in artistic, tumbling, acrobatics and rhythmic. Approximately 350 gymnasts aged 5 and over completed the first tier of ten in the assessment process over the last 2 weeks. We at RGC are delighted with everyone’s hard work and progress this year and are looking forward to a fun filled summer with two camps running in July and two camps running in August. Summer Camps this year will also be multi-disciplined including a variety of fun new workshops, games and activities tailored to groups of all different ages. Have a Happy Summer Everyone!